If you are a startup business and lead hungry then smile!! As I have best strategies through which you can generate leads targeting your “Competitor’s Customers”. No doubt your customers have already done lots of hard work maintaining their brand and awareness. Your competitors have created the market for you, yes! You have a chance to steal their hard worked strategies. If you are a startup and have a budget limitation it will be very difficult for you to out beat those giant competitors as they already have invested huge amount for their brand awareness’s, does it mean that you don’t deserve to outrank them? Yes, you can!! Online marketing giant platforms like Google Adwords, Facebook, Twitter provide lots of growth hacks so that we can steal our “Competitor’s Customers” just little small budget. How to steal your competitor’s valuable customers? How to steal your competitor’s Google Traffic ? How to steal your competitor’s Facebook Fans ? How to steal your competitor’s Twitter followers? How to hijack your competitor’s unhappy customers? 1.Using Your Competitor’s Brand as keywords in Google Adwords. Major percentage of your targeted audience search about your competitor’s brand name in search engines. This traffic is very close to conversion funnel as they search for specific brand and product.Digital Marketing platforms like Google Adwords provide this option to tap into by running your ads on your competitor’s brand name or product. 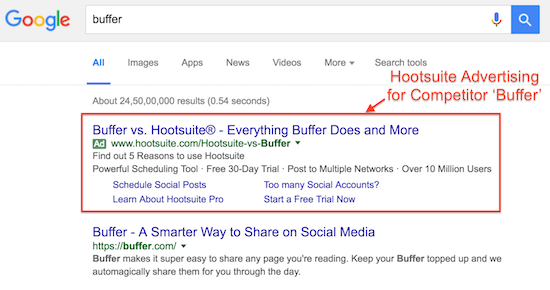 I recently noticed that Hoot suit’s (The Leading social media management tool) advertisement for its one of competitor’s brand name.This tested sweet steals of lead generation will help you target mature audience and will result in high conversion rate. Disadvantages: You cannot use brand’s trademark in ad copy of your adwords campaign. I suggest to read and follow rules and regulations or guidelines for using keywords as brand name in Google Adwords. Low-quality score will cost you little high in cost per click (CPC) which will be a challenge to maintain top rank in SERP. Of course, you are paying high Cost per click I will still recommend this practice as this will provide you high converting customers. Leading PPC experts recommend for bid on your competitor’s brand name for leads generation. Facebook is among top social networking websites and loved by all. Facebook have huge audience who can convert for your business. Although Facebook is not a search engine where your potential customers are searching for yet you can grab your competitor’s customers. Using Facebook you can display adverts via many targeting methods. One of the best targeting methods I use for grabbing my competitor’s customer is by running “Interest-Based Targeting Option”. Below is an example how I targeted “ShoutMeLoud” as my competitor. “Interest-Based Targeting Option” has jumped my conversion rate by 247%, which is almost more than 2X than the amount of lead I was generating earlier. Although ShoutMeloud is not my competitor yet their audience is fruitful for me. The worst part is that you never know how did your competitor build this fan following on facebook. Your marketing budget can be a total loss if they have used poor form of targeting on social media platform. Although, I will strongly recommend this as a healthy process of stealing your competitor’s customer. 3.Running Native Gmail Ads gave a boost of 241% more conversion with 53% drop in CPC. I have been using various emailing campaigns and mass mailing software available in market. I had using email marketing past one decade but I was not satisfied with the ROI. Email platforms like Gmail, Hotmail and Yahoo have high built-in automated spam detection which does not land our promotional emails in “INBOX”. Failure in Low rate of “INBOX” and “Email Open Rate” dropped my conversion rate. Email is best conversion platform for B2B & B2C business modules. Top companies are paying high to capture their niche related people’s email address.Mining your targeted audience email ID’s is a real pain. Google Adwords recently launched their new ad targeting “Native Gmail Ads”. Now, you don’t have to struggle to acquire email ID’s, Thank to “Adwords Native Gmail Ads”. Gmail Ads are featured in “Social” & “Promotional” tabs of Gmail. These ads look very similar to emails and highlighted as “Ad” in yellow highlight. These Ads can be created using various pre-defined templates and plain HTML codes. The beauty of this ad is that you can target the audiences who have been receiving E-mail by your competitor and have any content in their email that matches your particular brand name add your keyword. 4.Twitter Ads (Username-Based Targeting) Increased My Lead Pool By Whooping 92%. 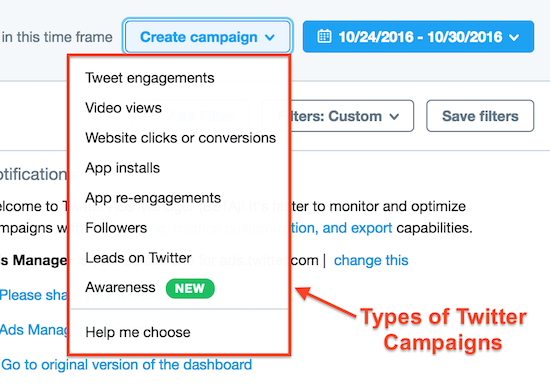 Twitter gives you feature to target your audiences based on their bio, companies & brands they are following and keyword-based targeting. The various free tools I will recommend to download your competitor’s account followers are Twitonomy, Audience and Followerwonk. 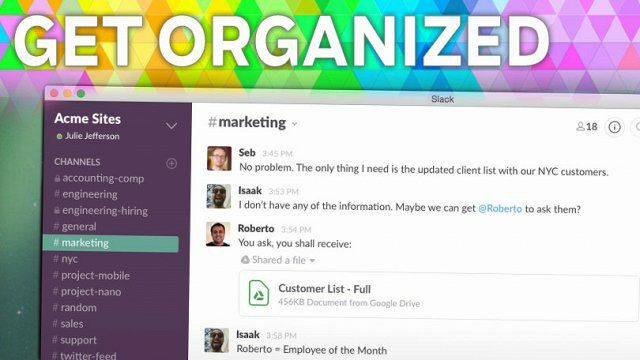 5.How Using Internal Messaging Tool (Slack) Helped Me Acquire My Competitor’s Unsatisfied Customers? Research has found that more than 30% companies use additional Twitter account for their high-end customer service. Customers tend to believe that complaint on twitter gives them prompt problem solution as compared to ticket submission or email communications. There is still a chance to steal your competitor’s customers the best way without even investing a penny which i have been doing a long time. Remember!! Customers are never satisfied and they will always have troubleshot problems related with your product and services. Unsatisfied customers are more likely to switch brands when they are irked or feel neglected. You can find many automated tools which are helpful to monitor your competitor’s brand mentions. I had created a channel called #competition on SLACK (Internal Messaging Tool) and create an automation via which all your competitor’s tweet display in this channel.Monitor & Respond Quicker than your competitor and steal the lead. Simple and clean way to generate leads for your business. Known as leading Digital Marketer in India, “Anup Prasad” has a 10-year background in Digital Marketing and is C.E.O of DTI and Chief Trainer. Well. These are in depths tricks that surly comes from lots of year's experience. Great post Sir. Thanks for an awesome post. Some tricks were new to me but sounds very effective. Will surely try them.... Thanks a ton Anup Sir!!!!! Nice article. Thanks. I have noticed that if i visit a website and bounce, I start seeing that site’s competitors display ads everywhere. Please let me know how I do that to target my competitors potential customers.